Siliguri, Sep 7: Even as Chief Minister Mamata Banerjee continued to defend her government over the collapse of Majerhat Bridge in Kolkata, a canal bridge collapsed this morning (September 7) in Siliguri's Phansidewa area. The canal bridge collapsed when a truck was passing over it. The dilapidated bridge caved in while the truck was crossing the canal. Truck is now stuck and efforts are underway to pull it out. There are no reports of injuries as yet. 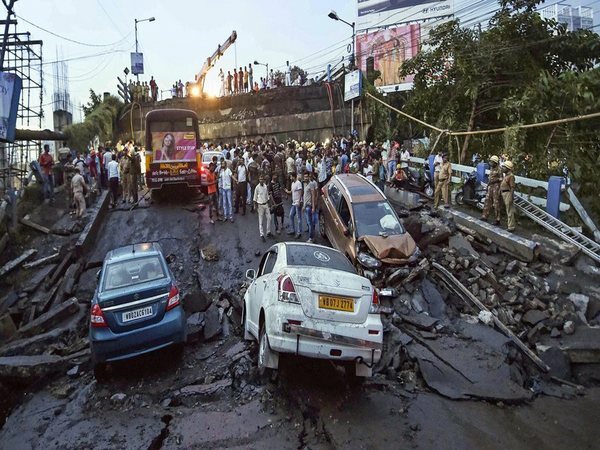 Mamata Banerjee-led TMC government came under fire from the opposition after a portion of Majerhat Bridge in Kolkata came crashing down on Wednesday. Three persons died and over a dozen were injured in the indicent. This was the third bridge collapse in the city since 2013. West Bengal BJP President Dilip Ghosh on Thursday claimed that negligence on the part of the state government led to the partial collapse of a south Kolkata bridge and urged Chief Minister Mamata Banerjee to conduct a thorough investigation into the matter instead of covering it up by bringing other issues to the fore. He also alleged that the bridge collapse is the result of the state government's tendency of giving contracts to the people of the state ruling party Trinamool Congress. Banerjee, on her part, assured that stern action will be taken against those responsible for the incident. Defending her government, she said that the bridges were not constructed during the Trinamool Congress's tenure so they should not be the only one to be blamed. On March 31, 2016, an under-construction flyover collapsed in the crowded Burrabazar area, the wholesale business hub of the city, claiming 26 lives. On March 4, 2013, a road bridge collapsed in Ultadanga area in the northern part of the city. There was no casualty.